Lately I have been busy preparing for the Detroit Urban Craft Fair coming up in a couple weeks. 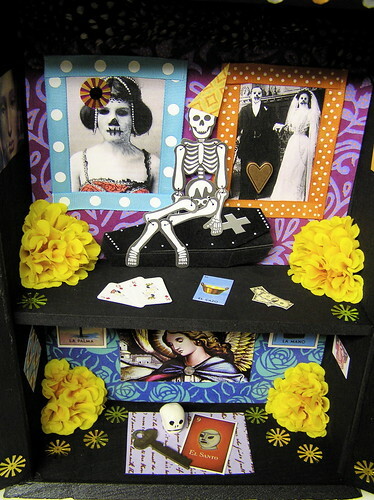 I did manage to enter a Day of the Dead shrine competition at ART634 in Jackson. The display period ends in a couple of days, and then I will know if I won a free exhibition of more of my work! A couple years ago a friend of mine had a garage sale and was going to throw away a perfectly good mini cabinet (gasp!) I loved making ATC’s and collage, so I knew I could do something with it. I didnt end up getting any inpiration on what I could do with it until this competition arose. I wish I would have had someone around to take some “action shots” of me working on it, but all I have are photos of the finished shrine. 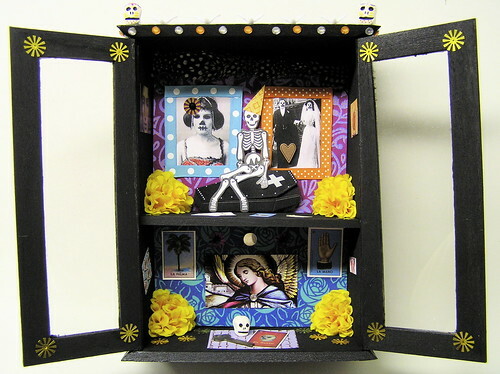 I called it, “Caja muerta viva” which means, “Living Dead Box”. I tried my hand at creating polymer clay sugar skulls for the exterior, which I believe is the extent of my abilities! I got to finally use some supplies from ATC swaps I’ve collected over the years, and make good use of a jointed skull and 3-D coffin. The overall shrine consists of paper elements, handmade/handpainted papers, sequins, jewels, mirrors, plastic doves, paint, and ribbon.